Have you got a great idea to help protect our region’s special plants, animals or landscapes? If you need some help to get your project up and running, then Fitzroy Basin Association (FBA) might be able to help. Community grants of up to $20,000 are available now through FBA, thanks to funding available under the Australian Government’s National Landcare Programme. FBA Project Officer Kelly Smith said following on from the success of previous community-based environmental projects, grants are again being offered locally to fund environmental projects along our urban creeks and coastline. Project activities eligible for funding include revegetating sites, controlling pests, restoring dune systems, collecting marine debris or holding community environmental events. Grants can also fund public, family-friendly events or educational programs that enhance community attitudes towards natural resource management and the environment. “FBA regularly engages with community groups to support them in delivering projects that make a big difference to local environments. 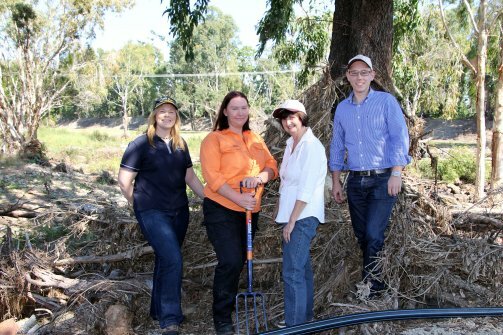 Our support enables community groups to access expertise, and to build their knowledge and capacity in caring for our region’s natural resources,” Ms Smith said. “We are always on the lookout for new community partners and we encourage all community groups to start their applications now!” Ms Smith said. Applications for the community grants are now open, closing at midnight on 24 July 2016. To find out more about the grants and the application process click here or contact FBA Project Officer Kelly Smith on (07) 4999 2836.